Another sunny day in San Diego! 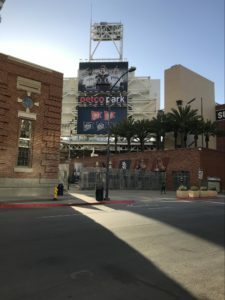 On my way to the Convention center, I pass the Majestic’s Petco Park, the stadium is next neighbor to the historic Gaslamp Quarter where I live. Super surroundings. Today is definitely the most hectic day. Design forum starts up at 07:30, my presentation on CircuitData is due for 09:30. This is for sure a day for presentations. After the presentations, I had the pleasure to be interviewed by Happy Holden and Andy Shaughnessy. A true pleasure. The interview went well – CircuitData was the theme, and they both seemed content. Lots of good questions, and I believe I made Happy, happy. We even talked about meeting up in Oslo later this year. I also had a good talk with Multek. They support CircuitData and might even be interested to join the board. Cadence was there, supporting CD and wanting a web meeting for further discussions, Orbotech was in the audience and asked for a meeting at their booth. 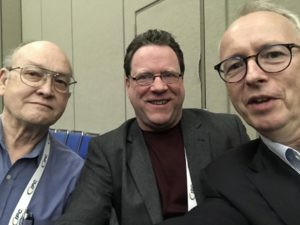 The Medical Addendum task group had a good meeting where we were challenged by Randy Reed, to be sure we link the micro PCB requirements to a design standard. We got quite a few issues to follow up during the next meetings. Our plan is now to reach a document for Industry review by IPC Fall meetings in October. Today’s meeting truly accentuated the importance of live meetings, where people can drop in, take part and join the discussion. What better way to end challenging discussions, meetings and presentation with the international reception for “meet and greet”. Like last year, I bumped into the «legend» Joe Fjelstad, also a member of the medical addendum group. Great to catch up again. I had a good discussion with Hans Peter Tranitz from Continental about the forthcoming IPC Automotive Reliability conference in Nuremberg 4-5. June, and talked to among others, Pete Starkey, Graham Naisbitt, IPC President John Mitchell, and Emma Hudson. Public manufacturing lists from UL? A great day ended up with a great dinner with UL at a very good restaurant on 5th Avenue. I am looking forward to my first UL technical panel meeting Thursday morning! The CD material database for sure opens up doors for good discussions. This time the topic was why the list of base materials, linked to each manufacturer UL approves are not public? I was encouraged to bring up the topic at the meeting Thursday. Tonight I also received a mail from John Perry that my proposal for PCB MSL levels have been taken on board for discussion and further development, and will be implemented as a requirement in the new revision of IPC-1601. Back in the apartment, I am tired but also satisfied with my achievements and contributions today. Already looking forward to day 3 of IPC APEX 2018. Kill the proposal – day two at APEX IPC celebrities and high temperature in task group discussions!